I work in digital communications. In the public sector. If there’s one obsession both disciplines share, it’s the quest for ‘engagement’. It’s often said about digital engagement that ‘we’ (organisations) need to go where people go. What that actually means to me isn’t ‘the people use Facebook so we’ll use Facebook and build a page there’. It’s ‘let’s go to a Facebook page that people use and talk to them there’. There’s a difference. Often when we think of social media we can forget what ‘social’ means in the real world. The ‘social’ rules offline are the same as those for online. So this is my case for why I think we should behave online like we do at real life parties. At a party, if you’re introduced to somebody you don’t ask them to please comment on the party or feedback on their life so far. In ‘What do you want from me? 7 alternatives to ‘Leave a comment’’, over on the brilliant Helpful Technology website, @Lesteph makes a great case for why we should think harder about the questions we ask. Places like Facebook are incredibly social spaces for many. We need to tailor our language to the occasion. And, one step before that, I think we should think about our manners. I’ve been thinking lately about how organisations seem to want people to ‘Like’ them, retweet them and leave comments on their blogs and consultations without ever repaying the favour. How rude. If you were asking a friend or acquaintance for a favour or some advice, you wouldn’t demand they travel to your house to hear your request. You’d probably go to their house or a place convenient for them to talk. If you were at a party making conversation with other guests, you wouldn’t expect every partygoer to talk exclusively about you and your life. So if we’re moving toward a more networked society, where organisations don’t do paternalistic or broadcast communications, why are we arrogantly sitting back and waiting for people to come to talk to us, like Kanye West posing in a VIP area? All good communication is two way – conversations have at least two voices, relationships allow for give and take, true engagement means talking about issues that matter to the people we serve not dominating conversations with what we want to talk about. Recently I was lucky enough to see Emma Meese deliver a fantastic demonstration at Oi! – the online influence conference. Emma’s spot showed us how to find online content where customers are talking about our organizations. Emma ran through advanced Twitter and Google searches can be used to get real time information about whatever we want. Finding and participating in what people are saying and doing is a fundamental part of good digital engagement. In my case – I work for a council – I want to find content that displays community life: I want to find what people are interested in and what communities are being formed. Maybe our organisation can help, maybe we can say well done to those making a difference, maybe I can share with other council officers what’s happening out there. Sometimes it’s critical but maybe we can leave a comment just explaining the reasons for why your organisation behaves as it does. More perspectives on an issue inform and enhance the debate. When my role was about press relations I was always arguing the case that the number of press releases we sent out was barely linked to the quality of work we produced. Yes we sent 20 press releases but they might have been edited/rubbish/not printed/ inaccurate/resulted in bad press. It’s about outputs I’d say – the resulting coverage and sentiment. Not so in the land of social media. I’m not so interested in outputs like impressions, reach and clicks. I want qualitative evidence to know that people care about what we do, where they live and that we are part of a collective effort to make life better in the county. A good party isn’t about how many people turned up or even how good the food and booze is. It’s about the company, the quality of the conversation. In digital engagement – if we are conscious of how many times we engage with our audience’s content compared to how much we ask them to engage with us we’ll be doing our jobs better and having a more fun party with fewer wallflowers. Commenting, ‘Liking’, retweeting and encouraging other people’s social content – that’s when we become part of a conversation. Not just waiting for everyone else to find us. Not talking about ourselves all the time like the party bore. And imagine if more than one of us from our organisations are doing it and we start to teach our colleagues how to comment, share, show appreciation, and be interested in other people’s online content too? I reckon that would be pretty engaging. And far better than the usual ‘please leave a comment’ box. I think many people airing view in public forums would be pleased that they are listened to and taken seriously! They can tell us to naff off if they like but I reckon making the first move will be appreciated by most people. That’s my experience form dabbling in this territory anyway! Helen: The great sage Lao-Tse observed that when the great leader’s work is done, the people will say “we did it ourselves”. It often seems to me that when the people have done something themselves (built social networks) then the organisations which pass for our great leaders say “how can we exploit it for our own purposes?” Let me put it this way. You want to find out what the people are up to by trawling public networks. Are you prepared to turn your council’s internal communications system into a public network so that the people can trawl it and find out what you;re up to? It seems only fair! Good point! I’d like to think of everyone trawling each other for information they’re interested in where it has been publicly posted. As soon as we’re all confident of our settings on networks – so we know which audiences were sharing with – and the tools for finding relevant information get better, it could happen! Then it becomes more important to make our content good and worth finding. This really brought it home for me, how we can apply everyday social occasions to our behaviours in an online community – and for the better! 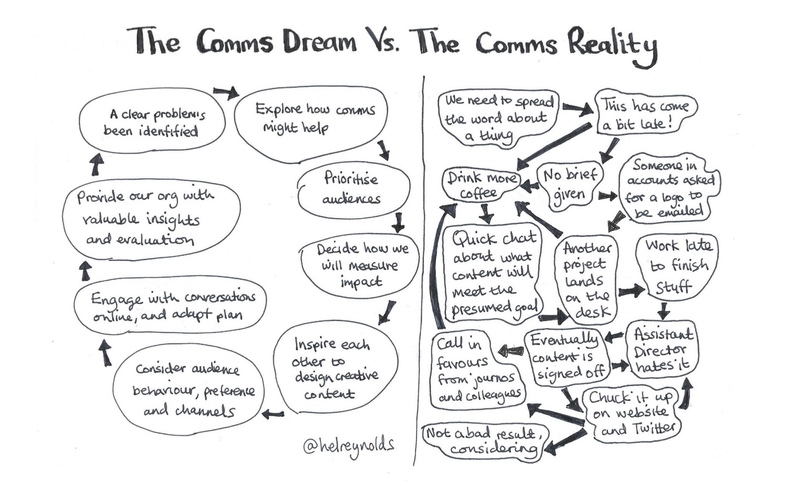 Great post Helen – you are a true comm’s philosopher! On one hand – it’s not rocket science is it? Listen to what people say , have a little fun , thank them for stopping by. But in practice so few organisations and individuals demonstrate this. Thanks for pointing out the pretty shoddy practice I guess we have all indulged in at times. Great post Helen – the language we use is really important in both online and offline engagement. We’re often surrounded by formal language in organisations and we have to really remind ourselves this isn’t how people want to interact. Can’t even count the amount of times we’ve been at events and people have asked for acronyms to be explained! Sorry for the two re-blogs from other organisations – just happened to log in this morning and see there’s lots of great stuff going on! Great post here from Helen Reynolds on use of language and making our social media more sociable. Mae’n ddrwg gennym ar gyfer yr ail-blogio erthyglau bobl eraill – wnaethon ni mewngofnodi bore ‘ma ac wedi gweld ar hap bod llawer o bethau gwych yn mynd ymlaen! Dyma blog gret gan Helen Reynolds ar ein defnydd o iaith a gwneud ein cyfryngau cymdeithasol mwy cymdeithasol. Great post, sounds exactly like the main premise of my book! Cool, great minds think alike huh?! I will be definitely buying your book on pay day, it looks ace – cheers for sharing! Cheers for your kind comment – and a big no to Kanye-style organisational diva-ish-ness! So, the public sector is obsessed with the quest for engagement? Since you work for Monmouthshire CC I have been looking at Monmouthshire’s web site (I don’t whether you work directly on that, but I hope some points will be resonant.) Almost every page has a Wordle graphic in which words like “transparency”, “open” and “engagement” are prominent. It gets annoying after you see it a few times, and, without context, looks like “here is a list of words we have heard which sound trendy”. Is this a claim to be more transparent & open than the basic legal requirement? Are there policies in place to achieve this? Is there any data on whether this is being achieved? – there is no remotely germane heading in the “Council performance indicators ” or “Key outcomes performance” on the data page. Turning to the “Consultations” tab under “Services” we find “Monmouthshire County Council post consultations on a regular basis to gain public insight into decisions being made” – however – “There are currently no consultations within Monmouthshire County Council”. So, the County Council is currently contemplating no decisions on which public insight would be useful? Engagement is turned on and off at the Council’s behest, and the switch is currently in the “off” position. No indication whether it will be turned on in January for a budget consultation, as it was earlier this year; no suggestion that if you have a burning issue you can raise it at an area committee. Did you know that the council’s constitution (Section 14) says that “The Leader will call a state of Monmouthshire debate annually … the form … enabling the widest possible public involvement and publicity.”? Does this supposedly annual event ever happen? – searching the web site yields no trace of it. I could go on about the web site betraying council insider thinking rather than public thinking (minutes of meetings filed with the agenda of the NEXT meeting rather than the one they relate to; “Council Structure” giving just officer reporting lines, not an outsider’s intro to who does what; no clue as to what a “Strong Communities Select” actually does …) but maybe that’s enough for now. Maybe before you start devising new and dubiously effective ways of mining social media for engagement, you should be sure of how much engagement you really want and whether you are getting the best use out of conventional (if web sites may now be so called) channels. I can see your points here and, although we’re making efforts to get better, there’s loads of room for improvement. My role is essentially community engagement but my team looks after the website and we’re in the process of making lots of changes to make it more user friendly and useful. Points you raise here are great feedback. Ensure scrutiny committees are explained clearly. It’s genuinely great to get these suggestions and I can’t promise that all points will be addressed immediately but I think you’ve given us a great insight into how people use the council website and thank you so much for taking the time to look at it and report back.